A couple days ago, I was sitting at the kitchen table thinking about everything and absolutely nothing at the same time. I was thinking about how I had a million things to do, but I didn't want to do any of it. Now, that's something that's not new. I get that feeling all the time. But this time, it was a little bit different. Over the days prior to this realization, I knew that something just wasn't quite right. For some reason, all of the things that I usually do to make me happy, just didn't make me feel good anymore. I felt hopelessly unmotivated to do anything, not even to indulge in the things that I once loved. So what was wrong with me? It felt like I was losing myself, like I was walking around empty. 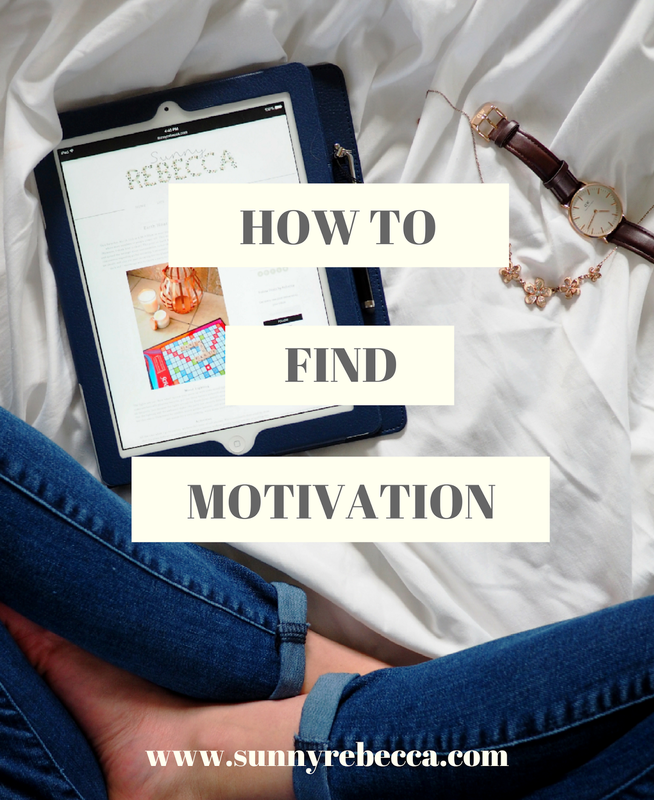 So how could I re-discover that motivation that I once had? It's so difficult to stay motivated. Most of the time when I'm unmotivated, I come home, sit in my bed, and watch Netflix for hours. And that was what I had been doing for the past few days. However, in my opinion, there are two kinds of a lack of motivation: the need to procrastinate and the loss of passion. The need to procrastinate is the every day lack of motivation, where you might have a huge paper due the next day, but you're doing everything and anything in order to avoid working on it because you just can't seem to motivate yourself to get going. Loss of passion comes in waves, much less often than the need to procrastinate. The loss of passion describes those periods where you just can't find the motivation to indulge in things that you're usually interested about, you just can't find the passion to get going and take action. So let's tackle these forms of motivation separately, since I believe that they are very different and also have different solutions. Sometimes getting motivated just takes remembering why you're even doing whatever task it is. With so much happening in life, especially if this is a task that you have been working on for a very long time, it can end up feeling like a chore after a while. Remind yourself why you're even bothering to do this. Whether it's something that you're passionate about that you're just procrastinating or it's something like a paper, you have to remember what you're working towards. Maybe you're working towards finishing a huge project or maybe you're working towards getting an A on that research paper. Regardless of what the task is, there's a reason why you're doing it and sometimes you just need to remind yourself that. This one is kind of similar to the last tip, but I feel that this way is a bit more of a stress-inducer in order to get the motivation, rather than something more positive. For me, sometimes I just need a little scare, a little stress that motivates me to get up and start going. I know that they usually tell you to "think happy and positive thoughts", but you don't really need to envision the good things that will happen to you, but you need to envision the consequences, the bad things that might happen if you keep on procrastinating. Let's say you have an exam coming up. If you keep procrastinating studying, you can visualize a poor grade. By visualizing a poor consequence that you don't want to see, it will get your stress going so that you'll feel more inclined to finish the task and make the image of the negative consequence disappear. We all make excuses. "I can't today, I'm too busy." or "I'll just clean my room first and then get started" or "I'm not feeling great, it's not a good time". When you're procrastinating, note those excuses, call yourself out on them. Don't let yourself believe for a second that those excuses are truth. Because they're not. Every time you think of an excuse, identity it as an excuse rather than believing it and going on procrastinating. I read this article titled, "How to Stop Procrastinating by Using the Two-Minute Rule" by James Clear and I thought that the two-minute rule was a great idea. Basically, you do anything that you have to do in less than two minutes now. For each goal that you have, even if it's a large one, if there's a small task that you can do in less than two minutes that will help you get closer to that goal, do it now. Clear relates it to Sir Isaac Newton's laws of inertia, basically saying that if you start doing one thing, even if it's a very small thing, it will become easier to continue doing it. By saying that you're only going to spend two minutes doing this task, you're a bit more open to tackling it. After that, once you start, it'll be easier to keep going. For whatever your passion is, sometimes you just need a cleanse, you need to step out of your little bubble and into something new. Let's say that you're a musician and you've been practicing non-stop for an upcoming performance, but you've recently had a loss of passion. Sometimes this loss of passion is due to an overwhelming amount of work. The amount of energy that you're putting in is becoming draining, like a chore. In order to change that, change the atmosphere. Stop doing all that work and start getting out, doing something new, giving yourself a moment to breathe and refresh. Maybe try out something new that you've never tried before. Maybe visit a place in town that you always pass but never stop by. Basically what you need to do is find a new perspective and have a change in scenery. two // get lost in a good book or movie. Like what I said before, sometimes you just need to take a step back in order to move forward. I think that a great way to refresh is to get lost in a book. Literature and film have this great way to transform your thoughts and to help you escape from the real world. I personally think that books are easier to get lost in than movies, if I have a really good book, I feel completely disconnected from everything else. Getting motivated might mean disconnecting. Passion doesn't come easily, it comes randomly, and nothing good comes from forcing it. Sometimes you just need to step away from your passion in order to rediscover it. Who knows? Maybe you'll come back with new ideas after your book or movie. Both not only help you escape, but fill your mind with new ideas and messages. three // starting with something simple. If you don't have the time or just don't want to step away, you can still find your motivation for your passions by still engaging in them. The great thing about passion is that it can stem from anywhere and sometimes all it takes is working on something very small, seemingly insignificant, that deals with your passion, in order to get a huge resurgence of it back. Like the two-minute rule, the inertia still applies. Once you get going on something small, your motivation and engagement will continue. Start out with a very small task, you might need to force yourself to actually get going on this, but once you start, your passion can take over and work it's way back. This actually happened to me, I was so unmotivated to blog once, so I ended up creating a very low-effort post, photo heavy, with minimal writing in order to encourage myself to get a post up. Since the post was low-effort, I was more willing to get working on it. However, once I started writing it, I got lost in it and I remembered why I blog. Sometimes, it's just that simple.